US stocks rallied on Friday, as bond yields slipped from multi-year highs earlier in the week and after absorbing the semi-annual monetary policy report to Congress released on Friday. The Federal Reserve stuck with its view that consumer prices in 2018 would likely remain at or beneath the 2.0% inflation target, implying there would be no need to raise interest rates more aggressively or earlier than anticipated. The US indices had a solid performance on Friday with the S&P500 gaining 1.6% while the Dow rose 1.4% and the Nasdaq climbed 1.77%. Oil service stocks were among the stronger performers as crude oil prices ticked up. Utility stocks also had a good day due to the pull back in bond yields and supportive monetary policy report. Telecom, semiconductor, natural gas and biotech stocks were also solid performers. 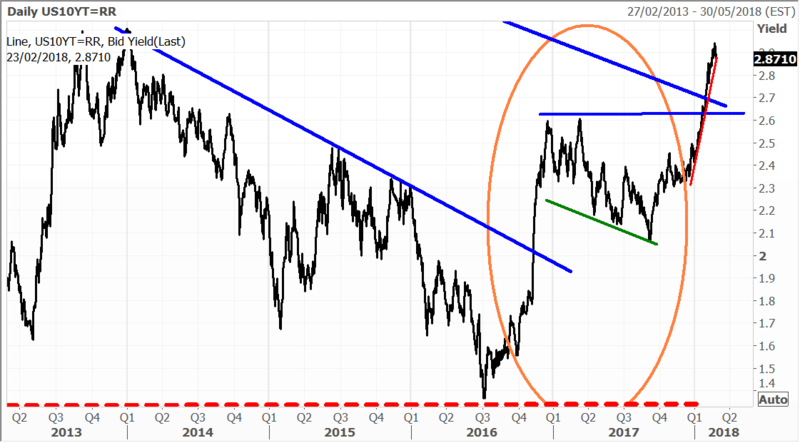 There is a coming correction in bond yields in my view. Record short positions have accrued in the US bond futures market, which raises the prospects of a near term reversal after the yield declined to 2.87%. After the breakout in yields on the 10 Year T Bond earlier this month, rates have probed the 3% level, but Friday’s downward price action says to me that resistance remains formidable. A test of the 2.6%/2.7% level (see below) is a probable scenario, but I don’t think the yield will go much lower than this with the US economy running at full employment and the build-up of inflationary pressures. The half yearly monetary report from the Federal Reserve indicated that the Board sees the labour market at or beyond full employment. German bund yields also fell away from medium term highs as the European Central Bank confirmed at a recent meeting that a pledge to expand its asset-buying program (if needed) will remain in place. Fed Chair Jerome Powell is scheduled to testify before House and Senate committees this week which will be closely watched by the bond markets. The yield on bund futures declined on Friday in line with US T bonds. 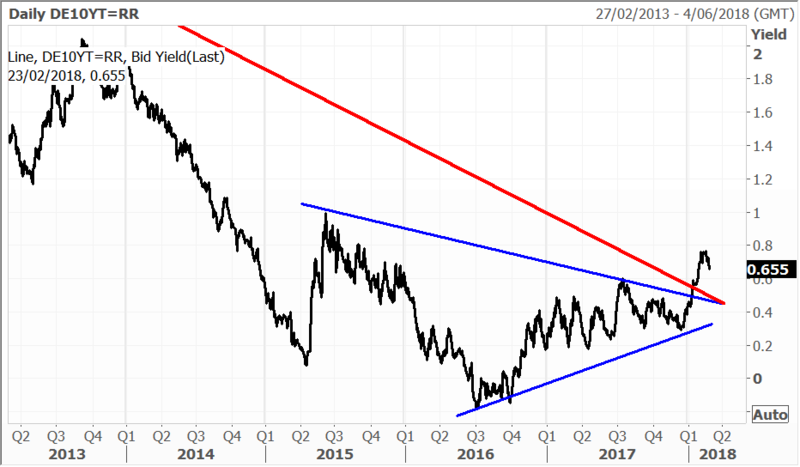 Like US T Bond yields I think are probable scenario for the Bunds is a retest of the break-out level around 0.4%. Commodities were stronger with West Texas Intermediate crude advancing 1.2% to $63.56 a barrel, capping a second week of solid gains. Gold declined slightly to finish at $1,331. Other technology stocks having a decent day included Google parent Alphabet, up 1.6% and Apple, gaining 1.7%. Shares of logistics giant FedEx surged 2.8%, bringing the shares back to within 8% of all-time highs. Walt Disney shares were up 1.9% as its Black Panther movie continues to do well at cinemas. Wynn Resorts followed the lead of its subsidiary in Macau and gained 1.8%. Shares of video game developer Activision Blizzard surged 3.7%. Most Asian stocks rose in trading on Friday as US bond yields slipped from multi-year highs hit on Wednesday. The futures markets are pointing to a positive start to the week. The greenback edged up against the yen, but the correlation with Japan’s stock market is breaking down. The benchmark Nikkei index gained 0.72%, with exporters and energy sectors among the biggest gainers. 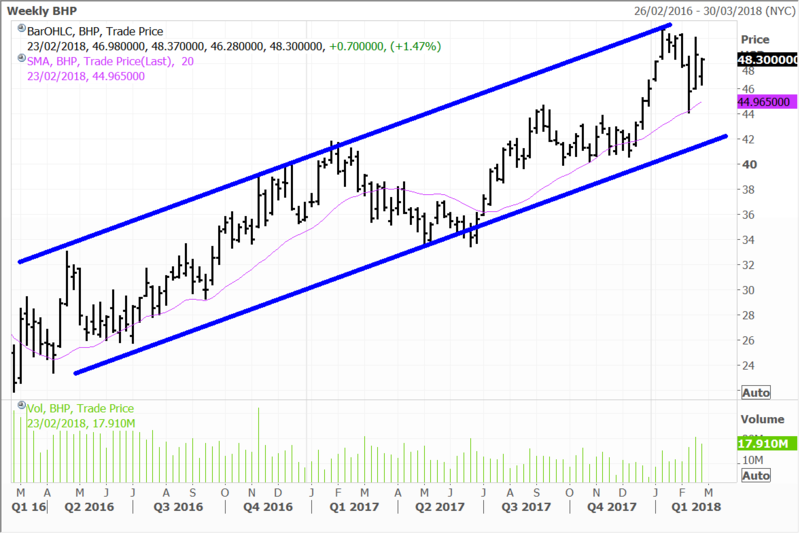 Energy company Inpex Corp rallied 2.1% and is held in the Global Contrarian Fund along with truck maker Hino Motors, which was up 0.6%. In terms of economic data, nationwide consumer prices in Japan rose 1.4% in January, beating the forecast of 1.3% and the 1.0% gain in December. Core consumer prices were up 0.9% year-on-year in January, just above the 0.8% economists expected. The Shanghai Composite gained 0.63%. Regulators in China said they would take over Anbang Insurance Group for one year from 23 February, as authorities crack down on excess debt in the financial system. Anbang is one of China’s largest insurance conglomerates and has been a big speculator in China. The takeover of such as large non-state company highlights how far authorities will go to reduce dangers to the financial system. The Hang Seng index advanced 0.97%, with the property and financial sectors some of the biggest gainers. Property developer China Overseas Land & Investment gained 1.8% and is held in the Asian Managed Account Portfolios. The Macau Casino operators returned to gains on Friday, led by Wynn Macau, up 2.8%, followed by MGM China advancing 0.9% and Sands China eking out a 0.1% gain. Energy company CNOOC rose 1.4%. All four stocks are held in the Global Contrarian Fund. In Australia, the market was on the up on Friday, with the ASX200 rising 0.82% to close less than a point below the 6,000 mark. For the week the index rose around 1.6% with global volatility subsiding, and the reporting season getting off to a solid start. Per UBS, a third of companies have beat expectations while 15% have missed. We have a few big names out this week, and we will be certainly paying close attention to QBE Insurance which reports today. Resource stocks outperformed on Friday, with a 1.5% gain, and the bid coming into the likes of BHP and Rio Tinto. South32 was the absolute standout though, with a rise of 6.7%. We hold these stocks in the Australian and UK managed account portfolios, with BHP and South32 also in the Global Contrarian Fund. I wrote last week that I believe there is more upside to come in the resources sector, with base metal prices yet to reach a cyclical peak. We have seen a number of brokers move to ‘underperform’ or even ‘sell’ (on South32) ratings recently, but they will more than likely be backtracking in 6 months’ time when the market starts to look ahead to the next reporting cycle and should our scenario of higher commodity prices play out. Precious metals will also benefit from a similar inflationary tailwind and as the best proxy alternative for fiat currency. It is worth noting that South32 has a “precious metal angle’ here as well, with the Cannington mine producing 6% of the world’s silver. Despite recent broker downgrades, the company remains a gem in our view, and I am certainly on the other side of the fence from the brokers that have a sell on the stock. 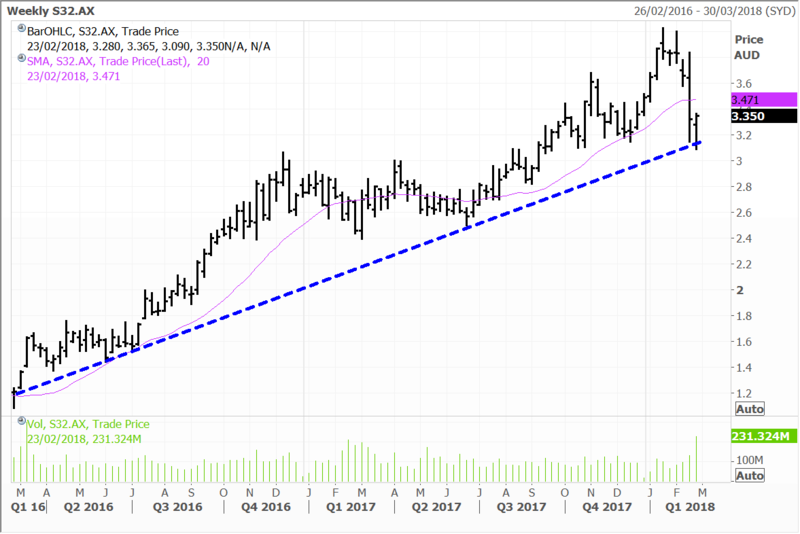 While the recent correction in S32 has been harsh, the two-year upward trend remains intact with the stock successfully testing and bouncing off key support last week. I also continue to like the much bigger and more diverse BHP, which has similar drivers and some company specific re-rating catalysts on the horizon. One of these will be the sale of the company’s shale assets, with a number of suitors lining up. Royal Dutch Shell is said to be amongst these, along with several private equity players. Proceeds could be the region of US$10 billion, and could be wrapped up by the end of the year, with the rump being returned to shareholders. Disclosure: The Fat Prophets Global Contrarian Fund declares a holding in: Walt Disney, 10 Year T bond futures, Inpex Corp, Hino Motors, Sands China, Wynn Macau, MGM China, CNOOC, QBE, BHP and South32. Previous PostPrevious What supply glut?